Quick Sticky Buns | Have YOU Ben Starr Struck? Over the last few years I’ve migrated away from commercial yeast and toward my sourdough starter. It’s gotten to the point that I don’t even keep yeast around anymore. This means my breads have gotten infinitely better…but also take infinitely longer to bake. There’s no such thing as “quick sourdough” anything. 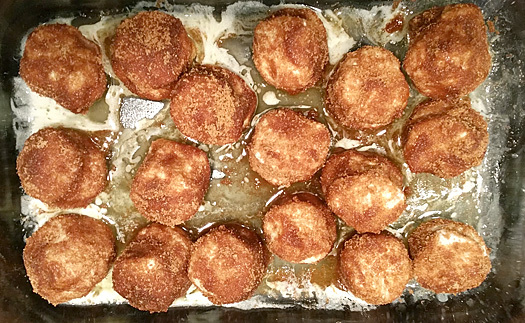 So while I have developed a few quick yeast bread recipes based on commercial yeast (1-hour English muffins, 1-hour Monkey Bread), I actually can’t make those any longer…at least on the spur of the moment…because I don’t have yeast! This morning, while trying to come up with something a little more special for breakfast than biscuits or pancakes, I decided to formulate a quick-bread recipe (ie, baking powder) for sticky buns. In the past when I’ve tried making cinnamon rolls with biscuit dough, they ended up kinda dry, and definitely not like a proper cinnamon roll. So I was dubious about the results. But these turned out really REALLY delicious, so I figured I’d share the recipe. Fold in half, flatten, and fold in half one more time. Flatten to about 1 1/2″ thick, then cut the dough into 12-15 squares. The buns after baking. You may notice some brandied fruit around the buns...I had some leftover from making stollen and tossed them in with the buns. Spoon the buns onto a plate to serve, and enjoy! 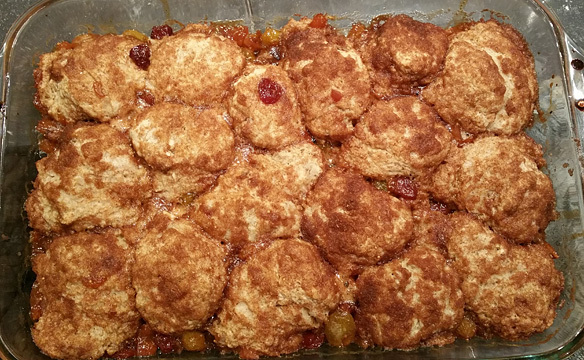 This entry was posted in Breakfast, Quick Breads, Recipes and tagged fast, no yeast, quick, sticky buns. Bookmark the permalink.